Orange trees are very thirsty. If you don't give them enough water, their leaves will start to curl and turn brown, and fruit may start dropping off. One of the challenges of watering an orange tree is figuring out how much water it needs; another is devising a way to ensure that the water stays around the tree instead of running off. Water needs will vary, based on the size of the tree, but an easy way for you to capture the water and keep it where it will be most effective, notes the University of Arizona, is to build a watering ring of raised soil around the tree. Measure the rate of water flow from your garden hose by timing how long it takes you to fill a 1-gallon bucket. Build a watering ring around the orange tree. Use a shovel to pile up the soil for the ring, which should be about 8 inches high and 2 feet wider than the diameter of the tree's canopy. Fill the watering ring with the amount of water your orange tree needs, which varies based on the size of the tree's canopy and what month it is. The University of Arizona publishes a list of general watering requirements by month and size of canopy (see References). Place the hose in the ring and run the water for the amount of time needed to dispense the amount of water needed, as you calculated in Step 1. For example, if your tree needs 10 gallons of water and it took you 1 minute to fill the 1-gallon bucket, it will take you 10 minutes to fill the ring with 10 gallons of water. 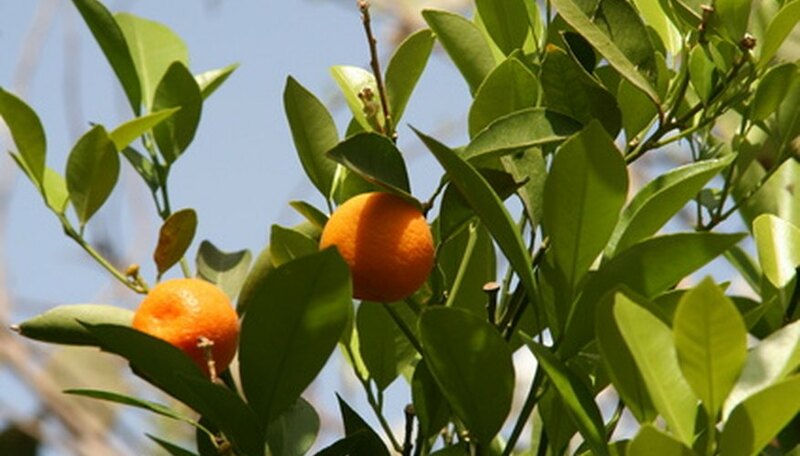 Apply 2 inches of mulch around the orange tree to help reduce moisture loss through evaporation. Wood chips, pine needles, straw and shredded leaves are all good mulching material. Water again three days later for orange trees in their first month of planting. Water every five days for trees that have been planted for two to three months. Increase this to once every one to two weeks for trees older than four months, according to the University of Arizona. In general, orange trees need watering when the top 6 inches of soil is dry to the touch, according to the University of Arizona.